A puppy named Journey got the second chance she wanted when she was given prosthetic paws, which allowed her to finally run again. Journey sustained terrible injuries 7 months earlier, when her litter was set on fire. Journey was the only survivor. Journey lived in South Korea when someone lit her and her siblings on fire on New Years Eve 2014. When she first got to the U.S. she had to wear padded boots to protect what was left of her paws - until money was raised to get her fitted with prosthetics. Journey's foster mom turned forever mom (funny how that happens), Marilyn Hendrickson, posted a few videos of Journey and her new prosthetic paws, the first of her cautiously trying them out, talking a leisurely walk around her new home. 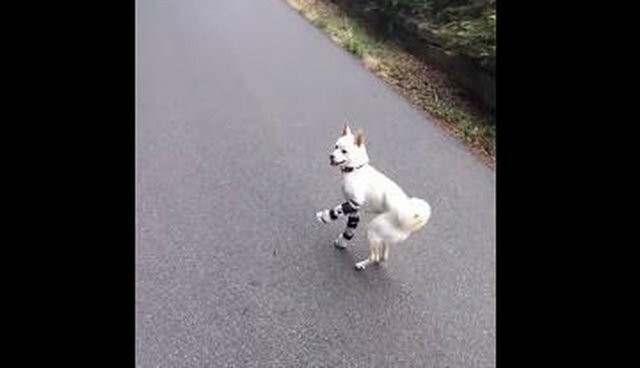 Finally, Marilyn posted a video of Journey running joyously after really learning how to move on her prosthetic paws, finally feeling free again. It's incredible that we now have the technology to give dogs like Journey the second chances and new outlooks on life they deserve. Run Journey run! Want to spoil your pet? Enter to win an exclusive Dodo giveaway of $1,000 to Thrive's pet market.